Parathyroid Operation: Parathyroid Surgery Video Performed by Dr Norman Examines All Four Parathyroid Glands. How is parathyroid surgery performed by the experts? Read this page while you watch the video. The entire 4-gland MIRP mini-parathyroid operation takes less than 13 minutes. This video explains the most common questions people with parathyroid tumors have, and illustrates how scans are usually wrong even when positive. Sit back and learn why all four parathyroid glands must be evaluated. (NO BLOOD). NOTE: There is absolutely no blood on this parathyroid surgery video. Most of the video shows the doctors talking about what is happening and you don't see much of the actual operation like you do in our previous video. We want all our patients to watch this video because it is so educational. The movie is narrated by Dr Doug Politz as Dr Jim Norman performs the operation. At the time of this filming (August 02, 2011) Dr Norman had performed over 20,000 parathyroid operations. As a team, these doctors perform over 79 parathyroid operations per week (over 4020 per year), virtually all of them are performed like this one. This operation is a 59 year old man that weighs 190 pounds. The main learning points are presented in groups. We do not use an endotracheal tube on our patients. That means we don't put a tube down into the trachea for deep general anesthesia. This patient is experiencing light general anesthesia - so he doesn't feel anything or move, but he is awake enough so that he breathes on his own and not by machine. He is getting some anesthesia through an IV (vein) and some inhaled anesthetics from an LMA. If your surgeon wants to put a tube down your trachea so he/she can "monitor" your vocal cord nerves, you should understand that your surgeon may not have much experience doing parathyroid surgery. We put the incision in the same place on all patients. 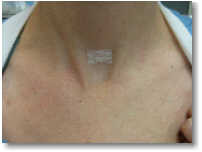 The incision must be put in the middle so we can get to all the parathyroid glands on BOTH sides of the neck. Any surgeon who puts an incision off to one side or the other should have his/her hands smacked with a ruler--it is never done by an expert. Any operation that has the incision placed off to one side has a cure rate of 80% at best (you will understand that after you see the video). If your surgeon isn't going to look at all four parathyroid glands, then your surgeon is not an expert. With a number of surgical "tricks" learned from doing many thousands of these operations (that you can't appreciate completely because you can't see into the wound), we can see all four parathyroid glands through this incision that is about 1 inch in this man. We do not need a big incision to see all four glands. Also, we evaluate the entire thyroid through this small incision. Most of our operations are done through incisions that are 1 inch. This Sestamibi Scan is Great Quality and Clearly Positive: But Wrong! 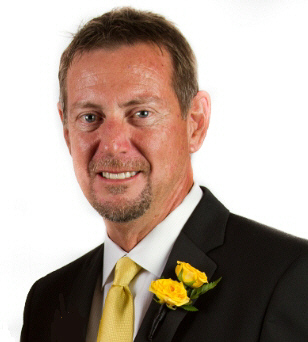 It is very important to realize that this man had TWO parathyroid tumors even when the scan said he only had one. Of course we did not know this ahead of time--there is no way of knowing which patients will be one of the 25-30% that have two parathyroid tumors. When we found two in this man, it gave us the perfect opportunity to show that sestamibi scans are over-emphasized and are usually wrong. This case was not staged, but several important points about sestamibi scans are made during this video such that you may think we knew that this man had two tumors ahead of time--but we did not! We look at all four parathyroid glands in almost every parathyroid operation we do--because you can't tell by scan how many bad ones exist. This is why we roll our eyes when our patients have a scan and then ask us "how many bad parathyroid glands do I have?" We tell them: "We don't know, we haven't performed the operation yet". Listen up folks... scans can never tell you how many glands are bad. If you learn nothing else from this parathyroid operation video, then learn that scans are not accurate, and are just a tool we use. The scan will not hold the answer to your problems. Scans cause more problems than they solve. Scans are wrong more than they are right! Chill on the scan folks! And tell your doctors to chill on the scans too! Positive sestamibi scan showing deep right upper parathyroid adenoma, a normal thyroid, and nothing else. This sestamibi scan clearly shows a normal thyroid and one large parathyroid tumor. This scan is as good as it gets, and it is absolutely perfectly positive showing ONE parathyroid tumor. Note that the scan is better and brighter in real life, and on the video--it doesn't reproduce well here. About 23 years ago when Dr Norman was first developing mini-parathyroid surgery he was of the opinion that a very good quality sestamibi scan (like this) showing a single parathyroid tumor would allow for a one-side (unilateral) parathyroid operation. If there was ANY question about a second tumor, then both sides of the neck would be examined, but in cases like this, he would have (many thousands of operations ago) operated on only one side of this man's neck. This case is the absolute perfect example that shows a one-side parathyroid operation will have a cure rate of only 90% by even our surgeons (who do 79 per week) because some of these folks will have a second tumor that CANNOT BE DETECTED EVEN THE BEST SCAN IN THE WORLD. Lesser experienced surgeons using scans that are not as good get cure rates of 75-80% with one-side operations. At virtually every other hospital in the world, this man would have had a one-side (unilateral) parathyroid operation the way Dr Norman developed mini-parathyroid surgery 25 years ago and this man would have been "better" but not cured. He would have been "better" because a large parathyroid tumor was removed, but he would not have been cured and he would need a second operation anywhere from 3 months to 2 years later to remove the second tumor (that was smaller, and not detected on the scan). We almost never do a one-side parathyroid operation any more, for the reason you see on this video--a second parathyroid tumor can be hiding and the scans will miss it! Besides, as you saw on the video, we can look at all four parathyroid glands so fast it doesn't make much sense not to do so. The only way to get near 100% cure is to examine all four glands and see how active each one is. Period. One more note folks, "mini" does NOT mean "one-side". Our operations are smaller than anybody else's in the world, and ours are both-sides. About 18% of the operations we perform are on people who have had one (or more) parathyroid operations somewhere else that did not cure them (we do 2-4 re-operations daily). Often it is because they had a one side operation that removed a tumor and their labs did not become completely correct afterwards. These folks have a second parathyroid tumor just like this man. Even though the sestamibi scan clearly shows only one parathyroid tumor, up to 15% of people will have a second tumor that does not show up. Only the big tumor shows up on the scan, the smaller tumor is being suppressed by the big one so it doesn't show up. If you don't remove the second tumor it will continue to grow (all tumors do) and become the dominant tumor and these patients are not cured of their hyperparathyroidism. These patients will need a second operation to take out the second tumor. We do NOT perform one-side parathyroid operations routinely--about 99% of the operations we perform are exactly like this--examine all four parathyroid glands quickly and safely. We invented the one-side operation--yet we won't do it any more because even with our experience it simply won't cure some of the patients. If your speak to a surgeon and he/she is going to operate on one side of the neck and then measure your hormone levels to see if you are cured, then write down our phone number--because 15% of you will come here for your second operation. The lesson learned here is that sestamibi scans are usually wrong. If they are negative then they are wrong 100% of the time--the patient has a tumor and it is just hiding behind the thyroid and it can't be found. If the sestamibi scan is positive (like it is in this video), then it is wrong about 60% of the time (like it is in this video). Hey! Are you listening? A negative scan is wrong 100% of the time. A positive scan is wrong about 50% of the time! Stop worrying about the scan! Stop getting scans! After you see this video you will understand why we say emphatically that all our patients get a mini-operation. We perform the same mini-operation on patients with a negative scan as we perform on patients with positive scans. This patient is the perfect example, the RIGHT side of his neck had a positive scan and one parathyroid tumor and one small normal gland. The LEFT side of his neck had an excellent quality, perfectly negative scan. The operation we performed on the left side of his neck was exactly like the operation performed on the right side. The scan-negative left side of his neck had a parathyroid tumor and a normal gland--just like the scan-positive right side. We perform the same mini-parathyroid operation on all people, and those with a negative scan have the same mini-operation that takes the same amount of time as those people with a positive scan. As you can see on the video, the operation on the left side (the negative side) was actually faster than it was on the right side! Recurrence rates for 16,500 people according to whether initial operation was unilateral vs bilateral. All believed to be cured at 1 month post-op. This graph shows the recurrence rates (how often somebody gets parathyroid disease a second time requiring a second operation). The blue line shows that people almost never get parathyroid disease a second time, if your surgeon operates on both sides of your neck and looks at all four parathyroid glands. Said differently, if your surgeon tests all four parathyroid glands, you can be assured you will be cured forever almost 100% of the time. HOWEVER, if your surgeon operates only on one side of your neck and tells you that he/she has cured you because they successfully removed a parathyroid tumor, then you have a 10-12% chance that you will NOT be cured during this operation. AND, even if you are cured, you have another 10% chance that you will need a second operation in the next 10-15 years because you are like the man in this video who had two tumors and the surgeon only removed the biggest one. Importantly, this means you will never have any of the benefits of the first surgery--you will not feel better, your heart disease will not get better, your osteoporosis will continue to worsen, and your risk of developing several types of cancer will remain high. Dr Norman is the inventor of one-side parathyroid surgery, yet he no longer performs this operation. Fortunately, as you can see from this video, a skilled surgeon can test all four parathyroid glands in less than 20 minutes on almost every patient--even if the scan is negative. Note: this graph comes from an upcoming publication by Drs Norman, Politz, and Lopez: DRAMATIC DIFFERENCES IN LONG-TERM CURE RATES FOLLOWING UNILATERAL VS. BILATERAL PARATHYROIDECTOMY: AN 18-YEAR, SINGLE-CENTER STUDY IN 16,500 PATIENTS. We tell people all the time: Do not get a sestamibi scan if you want to come to our center--we will not look at it. Scans are wrong more than they are right. If your doctor puts all sorts of emphasis on the scan, you will know that this doctor is not an expert. After you watch this video, you will know that scans are usually wrong and what you want is a skilled surgeon, not a good scan. Forget the scan, it's not about the scan. It's not about the golf clubs, its about the guy swinging the golf clubs. Stop emphasizing the scan--or better yet, refuse to get one. It isn't necessary and will be wrong. "Dr Norman, if the scan is so worthless, why do you get one just before your patients go to the operating room?" Because we use the scan to give us different information! We do NOT use the scan to find the tumor (like your doctor will do). We use the scan to make sure your parathyroid is not in your chest. We use the scan to see if you have a thyroid goiter, or there is a thyroid problem (like a cold nodule) that needs to be addressed while we are in there taking out the parathyroid tumor. We use the scan to make sure your parathyroid tumor isn't in some weird place like under your jaw or next to your heart. We use the scan to make sure there are no "surprises". Therefore, the NEGATIVE information that the scan gives is much more important than showing the parathyroid tumor. Clearly this video shows we have the expertise to find parathyroid glands very quickly and safely. We just don't like surprises! Most of all, however, we use the scan because we need the parathyroid glands to be radioactive so we can use the probe to determine how much hormone each of the parathyroid glands are making (read below). Most doctors get scans so they can "find" the tumor. The scan is not very good at this--even when it is "positive", it will be wrong 60% of the time. Stop getting scans! During the operation Dr Norman shows a small sponge with a few drops of blood on it. There is no trickery here... parathyroid surgery can and should be virtually bloodless. We look at all four parathyroid glands in about 99% of parathyroid operations we do. There are some rare exceptions not worth discussing here. If you come to our center for a parathyroid operation, you can expect to have all four of your parathyroid glands examined to see 1) how big they are, and 2) how much hormone they are making. It is simple: the good ones stay in, the bad ones come out. 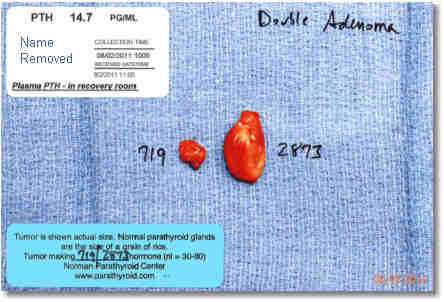 Of our last 10,000 patients, we removed more than 1 parathyroid gland in about 25% of people. That puts them on the blue line in the graph above and keeps them off the red line! All four parathyroid glands can be examined for their anatomy and hormone production through a very small incision. This incision is smaller than anybody else in the world makes. We make this same little incision all day long, every day. All four parathyroid glands can be examined in less than 10 minutes from the time the operation starts. (Believe it or not, nobody else in the world can do a 4-gland parathyroid operation in less than 1 hour). One of the reasons we made this video is because many surgeons say it is impossible to do a 4-gland parathyroid operation in less than 1.5 hours. Unless they see it with their own eyes, they don't believe that we can do this in less than 20 minutes. This is why we shot the entire video with one continuous filming. There is no editing, and we show the clock many times. No trickery here: a surgeon that does the same operation many times per day for many years gets very, very efficient. You can see the pathology report from this operation here - parathyroid pathology report. It shows that two parathyroid adenomas were removed and two normal glands were identified and biopsied. No trickery here. The Probe Measures Parathyroid Hormone Production from Each Gland. This is "MIRP" Minimally Invasive Radioguided Parathyroidectomy. The probe is used to measure parathyroid hormone (PTH) being produced from each parathyroid gland. The probe measures the "activity" of any parathyroid gland. This is a 4th generation probe, a probe (and technique) that was invented (and patented) by Dr Norman in the mid 1990's. MIRP is an acronym made up by Dr Norman in 1994 which means "Minimally Invasive Radioguided Parathyroidectomy". It means the probe is used to measure hormone production from the parathyroid glands using radioactivity, allowing the surgeon to get almost immediate feedback on the status of the parathyroid glands instead of measuring hormones from the blood (which takes an hour and is not as accurate) or getting frozen sections where the gland is removed and sent to the pathologist who looks at it under the microscope (which is completely stupid and 1945 technology). MIRP surgery has the highest cure rates because the probe assures that normal glands are left in, and all of the abnormal glands are removed. Sounds simple... but if your doctor is not using a probe, this is not happening. The probe measures radioactivity. The radioactivity attaches inside the parathyroid cells where PTH is being produced. Thus, the radioactivity contained within each parathyroid gland gives an estimate of the amount of parathyroid hormone that the gland is producing. Parathyroid tumors that are producing lots of hormone become very radioactive. Normal parathyroid glands become dormant (go to sleep) when the calcium is above 10.0 mg/dl, thus normal glands have almost no radioactivity in them. The probe is used to determine which glands are bad (making hormone) and thus need removed, and which parathyroid glands are good (they are dormant and not making hormone) and thus should NOT be removed. During the operation on the video, Rob (one of the assistants) takes the parathyroid samples from Dr Norman and scans them with the probe. The probe is connected to a computer which converts radioactivity into the amount of PTH produced. The probe is connected to a computer which calculates the amount of hormone being produced from each gland based upon its contained radioactivity. The operating room staff perform these tasks while the surgeon continues to operate. The amount of hormone each gland is making is recorded and becomes a part of the patient's medical records. This also helps us understand how much calcium each patient will need in the few weeks after the operation. A lot can be learned by knowing what the other parathyroid glands are doing--another reason why we want to see and evaluate all four glands in all patients. During the video you can see that the probe takes a measurement of the two tumors, and small pieces of the normal glands. We've measured the amount of radioactivity contained within well over 55,000 parathyroid glands. From these measures we have developed a standard-curve that converts the number seen on the probe into units of parathyroid hormone being produced. The numbers you see on the probe are not the amount of hormone, a computer makes this calculation. You can see the relative values... normal glands contain between 25 and 60 counts of radioactivity, while tumors are over 250 counts. The large parathyroid tumor in this man had about 2200 counts of radioactivity and the second tumor had 539. The computer converted this to 2873 pg/ml hormone production from the first tumor, and 719 pg/ml hormone production from the second tumor (see photo below). The normal parathyroid glands converted to 19 and 21 pg/ml/min, which shows them to be dormant (making almost zero hormone). It takes the probe about 2 seconds to measure the amount of hormone being produced from a parathyroid gland. We do not use intra-operative PTH monitoring, which is where the parathyroid hormone in the BLOOD is measured during an operation. That technology takes 45 minutes to know the answer and you have to wait 10-20 minutes after the parathyroid tumor is removed before you can draw the blood. Thus, it takes about 1 hour to perform intraoperative PTH monitoring (every time it is used, and usually surgeons use it multiple times per operation--which is why so many surgeons take 4-6 hours to do a parathyroid operation. We try hard not to poo-poo this technology, because it can help surgeons who don't do this operation very often. But we can tell you this, no expert would rely on intraoperative PTH monitoring. It is a tool for inexperienced surgeons. This is the only place on this 500-page website that we mention this technology. We would never use it because it is wrong 20% of the time and takes 1 hour. We operate on 1-2 people every day who had a one-side operation with the incision placed over to the side because they had a positive scan and their surgeon removed only one tumor and then measured intraoperative PTH levels--which showed a 50% drop in hormone. This is a fine test for non-expert surgeons and it can help them do this operation with an 85% cure rate. But, that means we get to remove their patient's second tumor--just like you saw in this video. We photograph all parathyroid tumors we remove. These photos become a part of your medical record with us and we send a copy of the photo to all your doctors (to teach them!). You will also get a copy of the photo. This is the actual photo from this operation that you saw nurse Laura take and then Dr Norman hold in front of the camera at the end of the video. The photo will have on it the amount of hormone that the remove tumor(s) was producing. In this case, the smaller tumor was making 719 pg/ml/min PTH hormone and the larger making 2873 pg/ml/min. The amount of hormone each of the other (normal) glands was producing also becomes a part of your record with us. This means there is no question about the function of the other glands. There should be no question that the normal glands are NOT removed. Trust us folks, surgeons who don't use this technique remove NORMAL glands all the time because they have no way of knowing if any particular gland is overactive or dormant. The white sticker at the top left of the photo shows the level of PTH in this man's blood 1 hour after the operation (we draw the blood in the recovery room as the patient is about to walk out of the hospital). Prior to the operation his blood PTH was 122 pg/ml. Now it is 14.7 pg/ml. The normal range is between 15 and 60 pg/ml. Thus, his PTH is below normal because the only parathyroid glands he has left are dormant (asleep) and doing very little. They always wake up in a few days. We know 100% he is cured because: 1) we saw and evaluated all four glands, 2) we removed two tumors, 3) the two glands that are left were proven during the operation to be asleep, and 4) 45 minutes after the operation his PTH has decreased to below normal. Note that had we taken out only the big tumor (the only one that showed on his scan), his PTH in the recovery room would be in the normal range (roughly 30 to 40). This would be lower than the starting point but not low enough. Within a week or two, the second tumor would be making far too much hormone and this man would still have calcium levels above 10.3 mg/dl, meaning that he would need a second operation. No Frozen Section Analysis to "see if it is a parathyroid gland"
Inexperienced surgeons will usually send the parathyroid tumor and any samples (biopsies) to the lab during the operation to perform "frozen sections". During the frozen section, the pathologist looks under the microscope and then calls the surgeon on the phone (while he/she is still operating) and reports whether the tissue is a parathyroid gland or some other tissue (like a lymph node or fat). Surgeons mostly perform frozen sections to make sure they found a parathyroid gland and not a piece of fat, thyroid, or lymph node. We do not do this, because we know what parathyroid glands look like. Most surgeons do not have enough experience looking at parathyroid glands, and will need the pathologist to tell them what they're looking at! We've seen more parathyroid glands than anyone else in the world, and can quickly determine that is a parathyroid (or not) and whether it needs to be removed (or not). Frozen section analysis costs $285 for the first one, and $195 for the subsequent ones (this is what Medicare pays the pathologists). While we are talking about cost, know that the intraoperative PTH assay discussed briefly above cost about $400, and when surgeons use this method they get a minimum of three, and often about 6. Now you know why our center is a "preferred provider" for parathyroid surgery for Medicare, Blue Cross/Blue Shield, Aetna, Cigna, Humana, etc, etc. We are cheaper for the insurance companies and have the highest cure rate. Frozen sections take about 12-15 minutes each (minimum!) once the tissue leaves the operating room. It takes the operating staff at least 2-3 minutes to fill out the paperwork for each specimen before it can even leave the operating room. Thus, if your surgeon is going to look at all four parathyroid glands, he will likely get a frozen section on each one. Now you can see one more reason why most parathyroid operations take 2-5 hours. All the stitches we use to close the wound absorb in about 1.5 months. They don't exist anymore after that. Note that the stitches used to close the skin are too small to see on the camera (smaller than a human hair). Thus there are no stitches to remove. This means that you don't have to go back to the doctor a week later to get the stitches removed, and it means you don't get an ugly "rail-road" scar. Ask your surgeon what kind of stitches they use on the skin--if they say you have to come back to the office to get the stitches removed, then get up and leave. Bandage: The band-aid we use is a simple steri-strip. You can shower the very next morning and get it wet. Just peel it off in one week. That's it. The techs and nurses that operate with our surgeons have been with us for years. These team members have performed many thousands of operations with these surgeons. Note that they give the instruments to Dr Norman during the operation without Dr Norman having to ask. They measure the size, weight, and hormone production from the parathyroid tumors that are removed (and the small biopsies of the normal glands which are not removed). Everybody in the operating room does this operation exclusively; they work in our parathyroid center and they don't assist on any other type of operations. Our excellent staff is another reason why we are so efficient. Everybody knows what they are doing and has done it thousands of times before. Also note that there are no surgery residents (surgeons in training) working with us. This man went home just over one hour after the operation. Most folks stick around about 1.5 hours. Some wake up faster and go home about 45 minutes after the operation while some feel a little punk and stick around 2 hours or so. Less than 1 in 1000 people spends the night with us. If your surgeon says that you may have to spend the night in the hospital, then you can bet your surgeon doesn't perform many of these operations per year. All of Our Surgeons are Really Good! The video shows Dr Norman operating. Drs Politz, Lopez, Boone, Ruan, Mitchell, and Parrack do this same exact operation with the same exact level of expertise--they have been trained by and operate side by side with Dr Norman for thousands of cases before they are allowed to operate as the lead surgeon. Also note that virtually every operation is performed by two surgeons, not one. Don't think you must have Dr Norman perform your operation. He'd let his partners perform his parathyroid operation, so you should too! All seven of our surgeons are by far the most experienced parathyroid surgeons in the world (and they work in groups of two or three, so virtually 100% of our patients get two of the 7 most experienced parathyroid surgeons in the world). This 13-minute operation seems pretty simple, yet no other surgeons in the world can do this operation this quickly, or with this high of a cure rate. Remember, this is what we do all day, every day. We don't do anything else. This was a routine parathyroid operation at our center; we just had a medical student come into the operating room and start filming. It wasn't staged. It was one of 12 parathyroid operations we performed that day. We wanted it to look like a casual YouTube video that wasn't a big production. If you liked the video on this page, then go to our Teaching Videos Page to see lots of other award-winning videos. As simple as this operation seems, know that this is the operation that most surgeons require 2-5 hours to complete via a scar that is 5 times larger. The photo on the right is from a woman who had "mini" parathyroid surgery in Dallas, Texas in 2010. It took almost 4 hours and she spent 2 days in the hospital. During the operation 12 frozen sections were performed and 2 normal parathyroid glands were removed. Even other experts take 1.5 to 4 hours to do this exact operation. If your doctor says that mini-parathyroid operations can only be done if the scan is positive, show this video to them--it is all dependent on the skill and experience of your surgeon and is NOT dependent on the results of the scan. If your doctor says that it is impossible to look at all four parathyroid glands in less than 1.5 hours, show this video to them. In 2013 our average operation takes just under 17 minutes. At least 4 operations per day are 15 minutes or less. The most common duration for a 4-gland exploration is 16 minutes. We do 11-13 of these operations daily, 5 days per week. We have a great team and everybody on the team takes pride in what we do. We strive to take better care of our patients than they can get anywhere else. There is a reason why over 3600 people travel to Tampa every year for their parathyroid operation--because this is all we do. Message from Dr Norman: We hope you learned from this video. We know we can't operate on everybody with a parathyroid tumor. We do know, however, that this website and these videos are changing the way parathyroid surgery is performed. We are forcing other doctors to adopt new technologies, or to decline performing these operations, sending the patients to another surgeon with more experience. Let's get everybody the best care they can get! If you like learning by watching videos, then check our our Video Page! Contact us to have our team of experts take care of you--one 4 hour visit with us and your parathyroid disease is over. See our page on "How to be Our Patient"